This is the heartwarming tale of a family’s struggle to help its extremely premature baby survive at a time when most tiny babies were lost. The author describes in accurate detail the sacrifices made by the mother, the midwife, and the family of the newborn in a small New England town in 1922. You won’t be able to put it down! Bernice Rocque’s novella, Until the Robin Walks on Snow gives a human face to the immigrant experience. With a solid foundation of research about the era, this fictional account based on her family’s history offers a charming portrait of family and community in southeastern Connecticut during the early twentieth century. It is a story shared by the many who came to America for a better life. The full reviews or excerpts shared below, unless otherwise noted, originate from the online sites of Amazon, Barnes & Noble, Goodreads, and/or Christianbook. As a new grandfather I have an enhanced appreciation for the challenges of childbirth and rearing. As a reader of history I have always appreciated how the human experience changes with the times. This story of historical fiction weaves these two topics together based on the authors personal knowledge of the actual people involved. The characters in her book are real people, her relatives and their neighbors of generations before. This story is not moralistic or nuanced. It simply is a slice of life of how some actual events may have played out in detail. I loved it. Until the Robin Walks on Snow is a work of fiction based on actual events by the Granddaughter of one of the main characters; an intriguing story of what might have happened. While being a quick read of only 202 pages, this short story explores topics of faith, friendship, loss, love, determination and commitment. Based around an immigrant family, the mother and her midwife are trying to save a premature baby against all odds during an extremely cold winter in America in 1922. The author describes everything the midwife and the baby’s family do to try to help him survive, which is so descriptive and real that you are transported right into the old farmhouse kitchen to watch the story unfold in vivid detail. This story shows how the midwife committed so much of her life to another family, before, during and after the birth. The methods used to try to save the baby were very interesting, rather shocking, but ultimately amazing. I found that the story ended abruptly and I was left without answers to a few questions that were raised throughout, which was a somewhat frustrating finish. However, at the back of the book there were Author’s Notes with more details, facts, family history and research behind the story about each chapter. This ended up answering a few of the questions I had. Overall, I really enjoyed this book and would recommend it to anyone who is interested in history, babies, birth and friendship. A great read on a Sunday afternoon with a cup of tea. Journal of the Australian College of Midwives, Volume 17, No. 1, page. 57. Autumn 2017. I just finished Until the Robin Walks on Snow. I’ve never felt like this about a group of people in a book before. The author has painted such a clear portrait of each one, I feel as if I’ve been part of their lives. Marianna and Helena were definitely friends of mine, especially Marianna, the woman who loved to crochet and enjoyed preparing the feast for her family and friends. Her life resonated in so much of my own, from the wood stove where she kept Antoni warm and cooked her meals to her irises in her yard. I would love to read more about her and how her life played out. Thank you, Bernice, for such a warm, loving glimpse into your family and for triggering warm memories of mine thru Marianna’s eyes. The author has meticulously researched her family history over many years and some of the fascinating details are outlined at the end of the book. The main part of the book is a fictionalized account of the birth of a premature baby and the struggles the family have to sustain the baby in a hostile environment. There are references to folk-lore and the family’s East European background which add interest and support the narrative. The characters develop strong personalities which shine through the pages. This family story is set in early twentieth century east coast America but it transcends geographical area and will be just as meaningful to readers in other parts of the world who have a feel for the past. Until the Robin Walks on Snow is a charming and insightful book and I loved reading every page of it. I stumbled upon this book and had it for many months before picking it back up and starting it in Christmas week – a perfect time to read about the lives of a multi-generational, immigrant family with a new born preemie baby, struggling in the winter, in the country. Rocque’s writing is quiet and unhurried yet the story moves at a steady pace. Several things intrigued me… the clear description of the “skin-to-skin” method of holding a preemie new-born. Four years ago, I was introduced to this method when our daughter-in-law delivered a preemie. What a lovely way to allow a tiny baby to stay warm: on dad and mom’s skin….the detailing of Wigilia – tho not the same type of celebration, our family celebrates on Christmas Eve – was an interesting window giving a glimpse into “other worlds” and their cultures….and, the mystery of the animals talking on Christmas Eve was a delightful concept. This was a short story that told a tale and also moved the heart. Animals talking – LOVE that concept/image. Until the Robin Walks on Snow is a great little story about a miracle baby — and an excellent portrayal of a family of recent immigrants to the United States circa 1922. The author tells us a fictionalize account of her family’s experiences. Although set some forty or so years later in history, its style is reminiscent of the Little House on the Prairie books though Until the Robin Walks on Snow shares the actions of the adult characters. …Until the Robin Walks on Snow is more than just the story of a baby’s survival. We see the dynamics of a family new to the New World but having opportunities that would have been unheard of in Poland and Lithuania. …I am not giving anything away to say that the author recently informed readers that her Uncle Tony celebrated his ninety-third birthday… A miracle child indeed! And a tender, endearing story tells us how he came into the world. Bernice Rocque is an extremely gifted and extraordinarily intelligent contributor to everyone’s elucidation, through her personal writing of the lives of her family in this, her first novel. Wouldn’t it be wonderful if we all could share the lives of our own ancestors as well? Majestic, stunning, exalting, this work is more than worth your while. Not complicated, simply touching the soul, with warmth, seriousness, culture, and roots, a national treasure! A wonderful Christmas story for the whole family, as well. From the beginning of the book, I was drawn into this simple story of survival in the early part of the 20th century. Ms. Rocque’s novel, a fictionalized account of a true story, is quite simply, charming. Her characters are genuine and believable and the situation, an infant born prematurely at the onset of winter, is tense and compelling. The author bolsters her story with solid facts and research which brings richness to the events. I thoroughly enjoyed… and can recommend Until the Robin Walks on Snow without hesitation. Until the Robin Walks on Snow was named a Finalist in the Faction category for the 2013 National Indie Excellence Awards – for good reason! Based on a true story, this “factional” novella weaves historical and cultural truths with the moderately-fictionalized story of Antoni’s premature birth to an immigrant family. Bernice L. Rocque highlights the difficulties this family faces with ardor: winter weather, numerous chores, the constant terror of losing another child, and the trials of caring for such a small baby in the early twentieth century. This novella is a short, easy read, suitable for teens and adults alike. The significance of the title and its tie-in to the plot of the story is beautifully done. Tension over Antoni’s fate carries the story to its conclusion, however Rocque also presents other conflicts, such as the strained relationship between the midwife and her husband as well as Andrzej’s guilt for relying on Marianna’s father Nikodimus. Though these conflicts could have been fleshed out further, Rocque has undeniably created a way for readers to experience the difficulty of life almost one hundred years ago, as if they are part of the family themselves. Well researched and written, this story is an account of an immigrant family’s careful and remarkable nurture of a premature infant at a time when infant mortality was nearly 100 percent among one and a half pound babies. The mother’s dedication to warming the tiny child with skin to skin contact, along with many interventions by her friend and midwife, bring about a heartwarming miracle. This story is derived from the author’s family history, and her detailed description of the Polish/Lithuanian families, their farm in winter, and the midwife’s wise care seem faithfully portrayed. The Christmas observances are wonderfully depicted. Very enjoyable read for Wintertime. This account of a tiny premature infant born to Lithuanian/Polish immigrant farmers in Connecticut is based on the author’s family history. The family was greatly aided by a family friend and neighbor, Helena, who delivered the babe and cared for the newborn and his mother for many weeks of a long winter. At that time, the mortality rate for one and a half pound babies was nearly 100 percent. The writer’s evocation of the lives of Northern European immigrants who arrived via Ellis Island and managed to raise a family and find work in 1922 New England seems authentic, and the portrayals of the mother and her friend the midwife are heartwarming. Don’t miss this novella – nice bit of local history! “Until the Robin Walks on Snow” is a charming novella by Bernice Rocque. Set in a farmhouse in rural Southern Connecticut, it is the imagined story of how a real family of Polish and Lithuanian immigrants braved the harshness of a cold winter to save a tiny premature baby. The heroic mother spent weeks holding the baby to her chest to keep it warm while her closest friend attended to her care as well as doing all of the cooking, laundry and cleaning. Readers are treated to some of the family’s ethnic holiday traditions, the experience of which is enhanced by language stylized after the old country. End notes written primarily for extended family members are an interesting chapter-by-chapter extension of the book. Loved it! You can judge a book by its beautiful cover. The writing and historical aspect of this book is unquestionably wonderful. The book drew me in and made me want to hug and help the Polish, Russian Immigrants in Norwich, Connecticut, as they fought to save a pound and a half baby in the 1920s. Through people I love, I have experienced what this entails today, and how difficult it is with all the modern conveniences. The clever and resourceful choices, complimented the courage of this family made the story unique and full of hope. A beautifully written story about the lives of immigrants living in Connecticut in the early part of the last century. A wonderful exploration of the hardships and triumphs of a family living under extreme conditions. How this struggling yet dedicated family care for a newborn who straddles the line between life and death is fascinating. I highly recommend this! This is a charming novella, the story of a close-knit family of immigrants from Lithuania in 1922. The story is based on the author’s family history and reflects, I imagine, the lives of many immigrants of the time. The mother, Marianna, has given birth in a Connecticut farmhouse to a tiny premature infant, and the book revolves around the events following the child’s birth and efforts to keep him alive. The charm comes from the gentle, supportive family who have great respect for each other and pitch in to help out when Marianna is having difficulty recuperating from the birth. The author presents a clear depiction of a tight, caring family. Also, the vivid images of the tiny newborn held in the palm of his father’s hand and the child lying on Marianna’s chest for days at a time for warmth are touching; they will not soon leave me. From the moment I opened my copy of UNTIL the ROBIN WALKS on SNOW I was hooked on the author’s eloquent prose, as she creatively marries fact and fiction. The story follows the birth a premature baby, Antoni, in the early twentieth century, “the smallest baby the doctor has ever seen–dead or alive,” and continues with the family’s struggle to save this 1.5LB child during an extremely cold winter. This has something for everyone. Historically and personally fascinating. The story provides a vehicle for the fragility of humanity and the power to overcome. A sensitive look at the best in all of us and the miracle of life we take for granted everyday. I enjoyed this book being a mother who herself had a premature infant nearly 45 years ago. I remember as a young woman there was an old man three doors down who was born premature himself weighing less than 2 pounds. He told us that his mother put him in a shoe box near the woodstove. I can tell you that in 45 years they have come a long way in keeping a preemie alive. Today they protect the eyes. Then they just put my son in an incubator to keep him warm and that was that. He ended up with several problems being born so early. I so admired this mother and midwife in all they did to keep this baby alive. Lovely story, could not put it down, now finding it hard to settle into another read as it is still in my mind, would definitely recommend it. Truly a wonderful story, but it ended too soon! Very touching story of this tiny infant and his loving family. The author has done her research and added the human touch by making it historical fiction. I would have liked to see the storyline continue until the baby was older, but I understand this was just a witness to the amazing accomplishment of helping such a premature baby live at all. Be sure to read the prologue and all the author’s notes, as they add so much to the overall book. You will enjoy this and remember it. Author’s Note: I appreciate, and am pleased that readers wish to know the future track of the characters in this story. A second book is in the works and will continue the family’s story. From the author’s family lore we learn of an heroic effort to save the family’s fragile son, born too early, and the support of the local immigrant community. The story acquaints us with many traditions of this mid-European culture. I got a glimpse of a culture much different than my own. Bernice L. Rocque’s novella, UNTIL the ROBIN WALKS on SNOW, leaves one charmed by an era in our recent past in which grandparents and grandchildren were each other’s best friends, in which extended families helped one other withstand severe hardships, in which people of all generations appreciated age-old customs for the social glue they provided, and in which simple amusements produced immense joy for all. Author Rocque infuses her touching novella with all these uplifting attributes in such an endearing fashion that one is left to ponder – no matter how much one embraces everything that is right and good about modern social progress – just how much has been lost and, more to the point, just how much can still be retained. One chapter in the novella masterfully illustrates the excitement, cooking, decorating, toasting, celebrating, story sharing, and various forms of communion associated with a traditional Eastern European Christmas Eve in a New England immigrant enclave of the 1920s. The scenes are replete with rich and fascinating cultural details interwoven with action and dialogue. This isn’t a ritualized family gathering; there is plenty of genuine heartache. But almost anyone reading this story would love to be part of this family because of its resilience under duress. One especially enchanting feature of this novella is its portrayal of a grandfather’s tender relationship with his granddaughter. This novella could be uniquely meaningful for middle school readers, because it could spark their interest in their own grandparents and encourage the young to cultivate their relationships with the old while they still have the chance. If this novella could inspire that to happen, then it will have not only painted a vivid picture of multigenerational family life, but it will have helped to rekindle it. As a writer and author for many years, I know how difficult it is to actually “see” and “feel” life as it was in the past. Then, even more difficult, to make your readers see and feel as you do. It means making it appear so real that the readers don’t even realize that they are moving back into time. Before they know it, the words move them backward to another decade or century. Readers are not aware – nor should they be – of how many agonizing hours went into researching and digesting the facts from that time period. In some cases, this research becomes especially difficult, as when writing on unusual topics such as childbirth about a century ago. The author needs to first research the topic and then write about it in a very normal manner, as if she was there experiencing the birth. Some readers “get it.” They appreciate the fact that all the details are easy to read and understand, as if they, too, were living during that time period. Others, unfortunately, see the writing as “simple.” They don’t understand this is what we writers want to achieve. It takes a great deal of effort and wordsmithing and skill to make something that is unknown to us today appear simply as it was then. “Until the Robin Walks on Snow” naturally transports us back into another world, which is what historical fiction is all about. If you have ever enjoyed listening to stories of how hard it was ‘back then’ this is a book for you. Careful research and authentic detail lead the reader into the lives of an immigrant family in the early 1900s as they cope with a premature birth and a wicked winter. There is a warmth of cultural detail, and family interactions; the reader is there at the table as the family celebrates Christmas, the baby’s survival, the robin heralding spring and the relief of having made it in this new country. A good read, I read it twice in one sitting. The book would be a great introduction for secondary schools to a unit on immigration or family history. So many stories in so many families – this one is authentic, touching and inspirational. My interest in local Connecticut history drew me to this well-told tale. Though fiction, it is based on a true experience in the author’s family’s lives – the premature birth of Baby Antoni who was only 1-1/2 pounds at birth. Even today that birth weight poses a medical challenge to save. In 1922 it was nothing less than a miracle of body and spirit of the child, the extended family, and the village that dedicated themselves to Antoni’s survival. The author’s blend of history and metaphor kept me very connected to the family and times. The historical notes throughout informed me so much. This is a valuable young adult as well as adult read. Back when little lives were still precious this immigrant family goes to great lengths to save the life of their premature baby who weighed a mere 1-1/2 pounds at birth. It’s a heartwarming story of the life and trials of this family in the 1920s. It is well researched and told in such a way that makes for easy and enjoyable reading. After reading the details and all the effort put into helping this infant to survive it’s amazing that with all the technology we have today, aborting infants larger than this is an ongoing daily fact. You will find this little book well worth the time spent reading it. As a first generation American I really connected with Marianna and her truly heroic efforts to save her preemie baby. My grandmother lost four children in infancy to “malnutrition” which was the listed cause death for her babies who were only days old. Unfortunately so many babies died in the hours or days after their birth. This book is a tribute to all women of her generation who struggled and raised their babies without much help from the medical community, but with the loving support of friends and neighbors. As someone who loves genealogical and historical research, I really appreciated this charming story based on Bernice Rocque’s family history. The story is rich with detail most likely gained by hours upon hours of research. Besides the fact that it is a very sweet story of a loving family’s attempts to save their prematurely born infant son, it is also a look into the past and serves as a wonderful historical resource. I loved this book! It’s a precious story of how a mother saves her 1.5 lb baby by giving her all. As a homeschooling mom, I think this would be a great living history book when studying the early 20th century and immigrants. I think that it’s particularly suited for girls. It certainly sparked a curiosity in me to read more. Bernice includes lots of information about the customs of Polish/Russian immigrants. Her research shows, and I particularly enjoyed the extensive author’s notes at the end. I think I should have read those first though – because I spent the entire story mispronouncing some of the characters names! Wonderful book!! Written from family stories using various means to weave the story into an interesting family history. The author describes the means used to keep a tiny baby alive during a very cold winter. I enjoyed this story and the author’s commentary at the end of the book explaining why she chose the path she took. I also loved the ethnic customs introduced into the book. 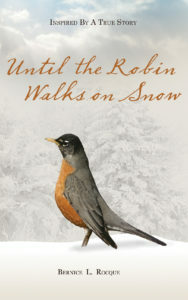 Until the Robin Walks on Snow is a recipient of the prestigious Mom’s Choice Award. The Mom’s Choice Awards honors excellence in family-friendly media, products and services. An esteemed panel of judges includes education, media and other experts as well as parents, children librarians, performing artists, producers, medical and business professionals, authors, scientists and others. A sampling of the panel members includes:… Parents and educators look for the Mom’s Choice Awards seal in selecting quality materials and products for children and families. This is the story of one immigrant family’s struggle, and of the sacrifices of another family when, in 1922, an extremely premature baby was born on a farm in a small New England town. Bernice L. Rocque has taken what information she was able to gather from family members, and has woven it together with historical research about the area, the way people lived, and what they had available to them, into a gripping story. Marianna, the author’s grandmother, was the woman who gave birth to such a tiny baby, at a time when most babies born so early did not survive. The child weighed only a pound and a half, and had to be weighed on the butter scale. At the time this story takes place, when a baby was born so early, “…it was not uncommon for midwives and parents to conspire, put the weakling in a shoebox behind the stove and abandon it to the inevitable.” Marianna, her midwife Helena, and their two families, made tremendous sacrifices to try and save the baby, named Antoni. Marianna and her husband Andrazej had two living children before Antoni’s birth, Nellie and Michal, but during the first years of their marriage there had been two babies that did not survive their births. The author has done a plethora of research into how wood and coal stoves of the time worked, as it was an important part of how Marianna, Helena and their families worked to keep baby Antoni alive. They also used a special tactic, with Marianna keeping the baby nestled constantly to her chest, skin to skin. For many months, Marianna could not perform her family duties, if she was to keep this baby from dying, and so Helena, her friend and midwife, came each day and did all that Marianna would normally do to keep her family going. Helena’s husband, Mike, also made sacrifices, in that his wife was not there to be with him, and keep up their home, during this time. Baby Antoni was born November, 1922, and while reading this wonderful novella, I spent many months in story time with these people from long ago, holding my breath with them, as they struggled so to save this precious little one, while continuing to try to live their lives at the same time. I learned about some of their Lithuanian customs that they had continued in their new life here in America, and got a better picture of the attitudes people had then regarding things like money and debt, attitudes which are completely opposite to those held by most people in today’s world. I learned that even though it took a lot of hard work and sacrifice, even a baby as early, and as tiny as little Antoni, had a chance. I found it very interesting that the author, who has been for years a family history researcher, upon hearing snippets of a story about this long ago birth, chose to write it as a fictional novella, realizing how difficult it would be to write a completely accurate non-fiction account, given that many of those involved are no longer here. I might have given up on the idea, if what I generally wrote was non-fiction, historical facts. The author has included a chapter by chapter section of author’s notes, giving more details about the time, and the people in the story, along with a thorough list of the sources she consulted in her historical research. I really enjoyed this story, and I think you will, as well. It caught my attention right away, and was hard to put down. Bernice Rocque’s novella, UNTIL the ROBIN WALKS on SNOW, is a lovely read, crafted in beautiful metaphors and poetic prose to paint a family history of what it was to be an immigrant family in the early twentieth century. The story focus is on an extremely premature baby son and the efforts the entire community of family go to, to keep him warm, fed and alive. The reader never loses sight of this effort under the umbrella of love in a backdrop of extreme weather, challenging methods to offer heat and sustenance to the baby, while dividing up the duties of the mother so she can tend to her child. This is a heartwarming story of tenderness and compassion, that depicts the best of the human condition. A charming read. Authors of historical fiction rarely explain which elements in their stories are documented facts and which are invented with an eye to the general conditions of a place or period in time, but Bernice L. Rocque does just that. Mrs. Rocque based her novella on the experiences of her Polish and Lithuanian forebears who immigrated to Norwich, Connecticut, in the early 1900s. She tells of their valiant efforts to keep alive a tiny infant born prematurely with the help of a midwife in November 1922 in their farmhouse which, like many houses in those days, had neither a bathroom nor central heat. Anyone researching family history can learn much from the notes that the author provides about the sources she used to accumulate the myriad details from which she constructed this compelling story. We thank our member Celia Roberts for bringing to our attention this book, which is fiction supported by genealogical research. I really enjoyed this story. I appreciated the insight that reveals how it came to be written. It had the feel of a wonderful close-up view of a resourceful family that had supportive friends and extended family. There was much revealed about immigrants and their traditions. There was much revealed about the customs of that time period. I suppose what I enjoyed most was the unfolding of the rich character of the people the author was sharing with us. I want that “midwife” as my friend. She beautifully demonstrated sacrificial love. I want the Grandfather to share with my grandchildren. The delightful grandfather at one point (when they were uprooting a Christmas tree), told his grandchildren that the tree was telling him things. When asked what he said to the tree he remarked, “I did not speak to it. One can learn much when one listens.” It is a well done simple story with much to ponder about the things we have lost in the passing of time. 11-year-old daughter enjoyed this book! My daughter really enjoyed this book. She wrote a book report on it, so she had to read it a bit quickly, but the story moved along, and was an “easy” read for her. She loved the subject matter and characters, and really heartfelt the story. A beautiful story of a mother’s devotion to her tiny baby and the family’s support for her as she struggled to save it! I found the relatively short novel had a lot more to it than Eastern European culture. It is a meticulously researched and detailed account of the winter 1922 and 1923 in Norwich, Connecticut, during which a group of mainly Lithuanian Immigrants fear for the life of a fragile baby. Antoni is the smallest baby the doctor has ever seen – dead or alive – and his survival is in serious question. Remarkable story of keeping a preemie alive through amazing circumstances, no medical technology, etc. the dedication especially of the grandfather touched me. The story was a very good account of life in the early 1900s of a family in their struggle with their premature baby as well as the living conditions at that time. It was based on a true story of the author’s family was even more interesting for me because I had know stories of living in those days and how different they were from today’s life both economically and socially. Very enjoyable. The author did a remarkable job telling the story of an immigrant family, their love for each other and friends and how that wove together to save a very premature baby. She did her research using her own family as the foundation. “Until the Robin Walks on Snow” is a beautifully-written, lightly-fictionalized recreation of an event in the author’s family history. It is truly “one of a kind” in its concern with accurately depicting its particular setting. Yet its recreation of the immigrant experience in the early twentieth century, full of sensory detail and vivid yet economical depiction of characters should make this a must-read for anyone, adult or young adult, looking to be transported to another world. I found this book fascinating because I have heard the story of my great grandfather’s birth which was similar to this story. My great grandfather was a twin born in 1897 so the challenges would have been even greater. It makes me appreciate the advantages of the 21st century. This book is a story of struggle, faith, determination, and how the mother of this tiny baby shows the love of a mother towards her child. I enjoyed this wonderful book and I learned so much about traditions and beliefs of other people. From the moment I opened my copy of UNTIL the ROBIN WALKS on SNOW I was drawn to read it. The image on the cover is lovely, the title intriguing, the author’s style of writing makes this novella very accessible, and eases the reader as if a guest into the home of this immigrant family. The notes at the back of this novella add important information to this meaningful reading experience. As a daughter of Polish immigrants I was brought back to my ethnic history – I smiled at each occasional Polish word, the chapter about Christmas Eve (Wigilia) was heart warming – especially at this time of year – and even some of the formality in the way the characters communicated with each other brought back memories. Interestingly one would think in a story addressing an intense situation there would be greater expression of emotion. Yet I feel that the author’s writing style purposely and effectively portrays the formality and emotional distance with which some Eastern European families communicate. This novella offers a captivating account about faith, hope, and the unwavering determination of an immigrant family’s struggle to sustain life. Ms Rocque’s eloquent writing creatively and mindfully manages facts and fiction. Focused on the events following the birth of a premature infant, the author’s attention to detail exemplifies the many ways this family loved and lived their life in America while maintaining a deep connection to their religion, traditions, and heritage. To me the birth of Antoni and the family’s focus to save the child during an especially harsh winter is symbolic of the often unpredictable tenuous journey that immigrants face when beginning a new life in an unfamiliar environment. Considering that the format of a novella is limited in length, the author manages to deliver an appealing story that relays a compelling description about how determination and the willingness of a small group of individuals working together made a difference not just in one child’s life but in all their lives. There are stories in UNTIL the ROBIN WALKS on SNOW waiting to be shared in greater detail including the friendship between the midwife and the mother, what became of the premature infant, and the potentially dangerous journey of the bootlegging grandfather. I hope that Ms Rocque takes this masterful beginning of a novella and considers expanding it into a collection of short stories or a novel. I’m always a little leery of local authors, been disappointed too many times but this read was excellent. She brings local history alive and makes me wish I had these sort of traditions in my family…..Perhaps we women can stop complaining that we’re ‘too busy’ after reading this. A lovely novella portraying the courage and love of a family as they try, against all odds, for the survival of a premature baby, in a time before modern medicine. I really enjoyed this story, and didn’t want it to end. “Until the Robin Walks on Snow” is a poignant tale of friendship, a mother’s love and a family’s faith and sacrifice. As I snuggled down into a comfy armchair to begin this novella based on a true story I quickly found myself drawn into a by-gone era and the world of this immigrant family that struggles against tremendous odds in their attempt to keep a premature infant alive through the winter of 1922. I enjoyed how Bernice Rocque weaves into her story well researched historical information such as small details about modes of transportation, Eastern European traditions and religious beliefs, the difficulty immigrants faced in finding employment, Prohibition etc. In doing so she brings the era to life. After reading the book in one sitting I found myself looking forward to more stories of Marianna and her family from this new author. I have purchased several copies as Christmas gifts for friends and relatives all of whom were born American citizens because their own grandparents or great-grandparents immigrated to the U.S. during the 1920s. “Until the Robin Walks on Snow” is a heartwarming book for the holidays or anytime. UNTIL the ROBIN WALKS on SNOW was a book I really wanted to read due to some of the local history involved. There is so much rich history in this area of Connecticut. At 202 pages I was able to read it comfortably in one sitting. In 1922 families in CT struggled in so many ways. This particular story details how one family and some really dedicated friends helped to keep a premature baby alive, through an entire winter, with all odds against his survival. The story really hit home for me when they were struggling to try and get Antoni baptized. Tiny and fragile they still needed to trek through the winter streets just to try to get to St Joseph’s Church… This was a really good story of the strength of faith, family and friends. A wood-burning stove sets the mood in this unforgettable story. From the first page, what I felt was the warmth and the overwhelming love that filled the kitchen of the farmhouse. Even when winter brings snow, bitter cold and darkness, light shines in the house where the mother of the tiny newborn, the midwife, the family and friends all help in a mammoth effort to keep the baby alive. This book based on events in the life of a real family in 1922 Norwich, CT was a wonderful read, truly inspiring and comforting (while Sandy raged outside my windows). The Author’s Notes were an unexpected bonus because, when I finished the story, I wanted to know more about the family, the setting and the medical aspects. Highly recommend. Great heartwarming story about a time in our history when life was simpler but much harder. It gives a nice historical perspective on a time rarely seen or talked about. It shows a toughness and tenderness our families showed just living day to day. I heartily recommend!!!!! As I read this book, I felt myself slowly drawn into a forgotten world, the one of our immigrant parents – what they faced, how they lived. Bernice Rocque vividly takes us into the lives of her Polish/Lithuanian/Russian ancestors during a critical moment, the birth of a pound-and-a-half baby that could hardly survive today, let along in the 1920s. We enter into a slowed-down world of love, family, faith, and hope. What makes this book truly unique is that the author couples good storytelling with strenuous genealogical reserach, orally relayed family stories, and local history to weave a very credible insight into days gone by. Very helpfully, she provides actual anecdotal information in her author’s notes. She models a creative way for people who love genealogy to bring alive their own family’s stories – and for that aspect, this novella is particularly unique and inspiring. This is a wonderful first book by this author. You experience the sense of an immigrant family, during the 1920s in Norwich, Connecticut. Share with them the worries of a premature birth and Thanksgiving and Christmas Celebrations. Learn their family history through the descriptions and conversations. Very well written.